4 March 2018...... Wakefield Trinity v Huddersfield Giants 'Trinity Jacob Miller. Picture Tony Johnson. 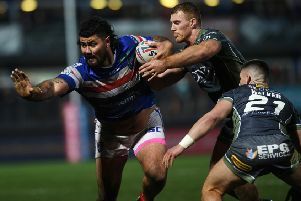 Stand-off Jacob Miller has given Wakefield Trinity a huge boost ahead of Sunday’s home derby with Leeds Rhinos by signing a new four-and-a-half-year contract. The deal will keep the 25-year-old Australian at the club until the end of 2022. Miller joined Trinity from Betfred Super League rivals Hull in 2015, initially on a one-year contact and has gone on to score 35 tries in 92 appearances. The former West Tigers play-maker said: “I am very happy, the club has come such a long way since I first signed here and it is nice to feel a part of something that is building towards something new. Coach Chris Chester said: “I am delighted Jacob has signed a new deal. “He is an outstanding player who still has a long career ahead of him. It is great he has committed his long term future to Wakefield Trinity.